King Boris is only 11, so he doesn't have any kids to name as heir. We'll stick with Prince Chopper (hey, I name these on the assumption they won't inherit) until Boris comes of age and can father some princes of his own. I married my sister off to the King of Rus, and was rewarded with an alliance. I suspect this will come in handy. I am planning to move on Satakunta (Finland) when I grow up. Five years fly by, and me and my buddy King Sviatopolok of Rus try to take down Satakuna. The attrition in the north is just terrible, though, and it takes up most of the treasure I've spent a couple generations putting away to win the war. 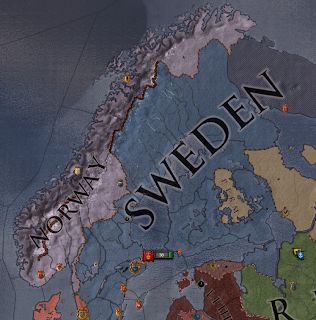 But win it I do, and I am halfway to my goal of turning the Baltic into a Swedish lake. It is 1141. I have been on the throne 10 years. I think I am eligible to tighten up some of the laws of the kingdom, but after all that war, I want to make sure people get happy again. Also, I have two daughters now, so my brother is still my heir.